Who wants to eat healthy Whole Wheat Chocolate Chip Cookies? The Santa who delivers gifts for us certainly does. So this year, Santa had a special request. He said he wanted cookies that were healthy, had no butter and wanted me to use whole wheat flour (if I could) and if I could skip the eggs, that would be a bonus. My Santa has become extremely health conscious this year and looks like he is turning vegetarian too. No, that is not possible, considering his love for fish curries. The truth is he just doesn’t like eggs. Since I am always up to a challenge, I told him while I would do my part by making cookies just like he wanted and he will need to do his part by eating them because the little elves that I have at home would possibly not want to eat a healthier version of their favorite cookie. As you can see, I was pretty sure that they weren’t going to turn out well and was thinking that I will probably add them to my list of recipes that bombed this year. I had never substituted both eggs and butter in any baked item, so that made me extremely nervous! But… I proved myself wrong!! The cookies came out really well – soft and chewy and the best part was I didn’t feel guilty about giving them to my 3-year-old! 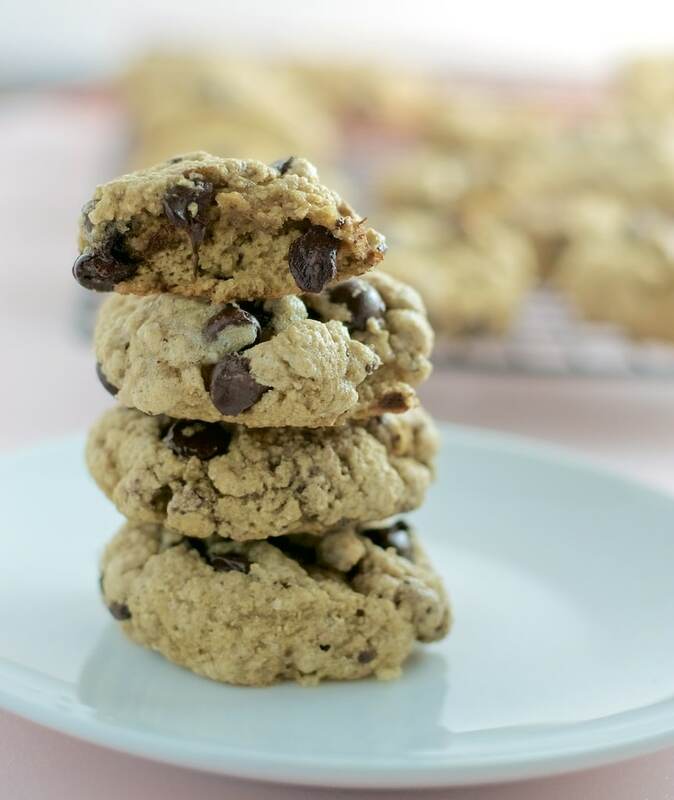 Here’s how I tried to make these cookies healthy, I replaced the butter with Greek yogurt and the all-purpose flour got replaced with whole wheat flour and oat flour. If you don’t have oat flour, you can use substitute it with either rolled oats or whole wheat flour using the same quantity. Note: To turn quick oats into oat flour, pulse the oats until they are ground into a powder-like consistency. Also, if you do want to use butter and eggs, I have included them in the recipe as substitutions. So this is the story of how we made Whole Wheat Chocolate Chip Cookies for the first time. 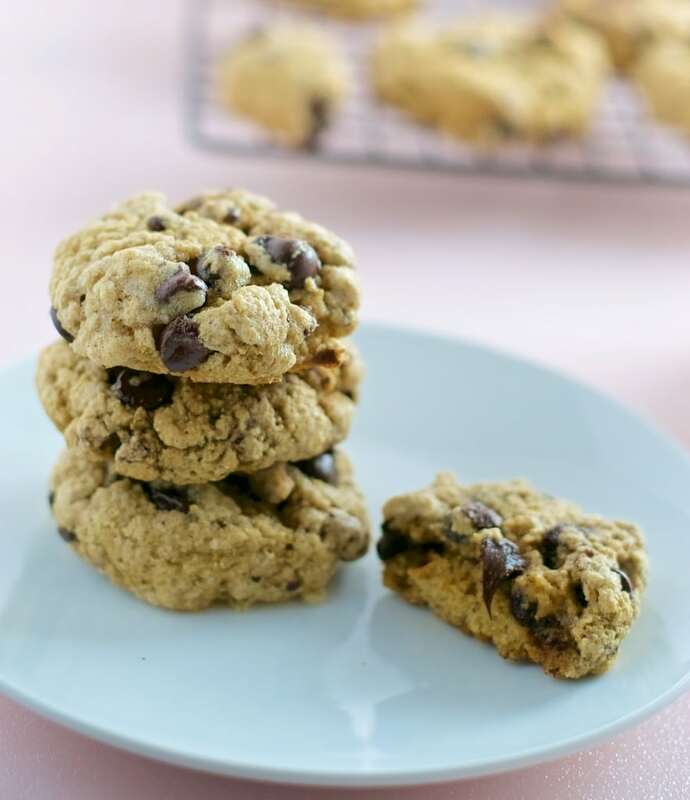 I was tempted to call it Healthy Eggless Whole Wheat Chocolate Chip Oat Cookie but that seemed like a mouthful and Whole Wheat Chocolate Chip Cookies seemed like a better fit! If you want a recipe for traditional Chocolate Chip Cookies, I have them here. Mix the dry ingredients: In a bowl, whisk together both flours, salt, cornstarch, and baking soda. Mix the wet and dry ingredients: Add the flour mixture and mix until they are combined (don't overdo it - maybe for a minute). Add the chocolate chips and mix them for 15 seconds. You are ready to bake. Cooldown process: Remove the cookies from the oven; wait for a couple of minutes and then transfer to a wire rack and let them cool completely (approximately 5-6 minutes) before you serve them.